Long blonde hair kissing blushing cheeks with sky blue eyes peering into the souls of millions I think of my rock legend icon, thin and frail, in his pea green sweater and my completely unhealthy obsession with Kurt Cobain as a young teenager. I had his name carved into my ankle (right above the Nine Inch Nails logo) and his image plastered on my walls. Nirvana was supposed to be my first concert. I had been listening to them since I was 9 years old courtesy of my siblings and I was obsessed. The day they were playing our town came and I was so very excited. My mom forgot to pick me up from school that day and my sister took my ticket. Her and my brother snuck into the pit and for many years (maybe to this day) my sister would brag about that time they saw Nirvana yada yada “I was this close!” She’d exclaim waving the wristband in my face or pointing to it where it was memorialized on her wall. My mom tried to make good on it and said she would make it up to me by letting me go to Lalapolooza which I also had wanted to attend for years- but in the end it didn’t matter. 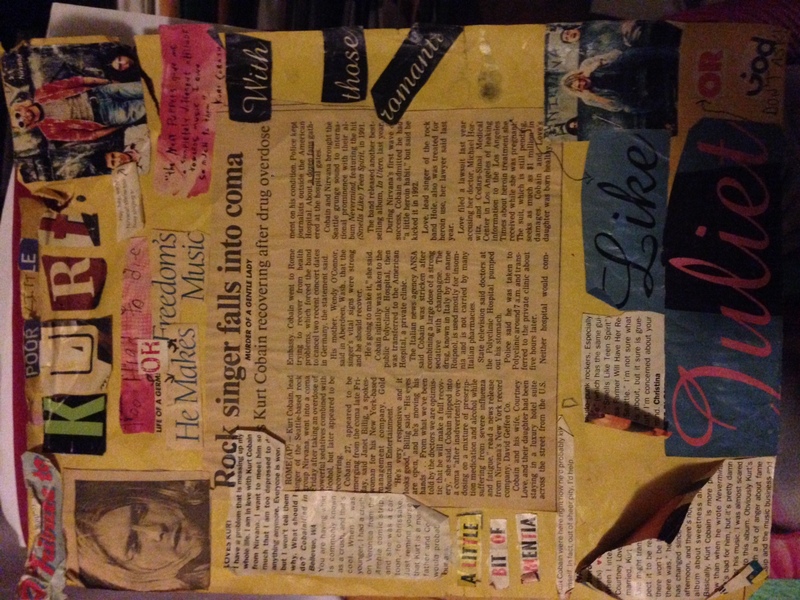 Kurt Cobain took his own life that April and the world was devastated- and so was I. He never wanted to be an idol. He never wanted to be the voice of a nation or a movement- yet he was- just like that. Grunge was in his honor and we all carried out his legacy. It felt like music would never be the same. I remained a loyal fan to this day. Ive been to countless art exhibits of him and the band, sat through interviews, documentaries, sifted through old magazines, listened to hours of unreleased footage, box sets, followed up on Frances Bean, and tried not to blame Courtney. Its amazing the impact this one individual has had on what feels like the entire world. 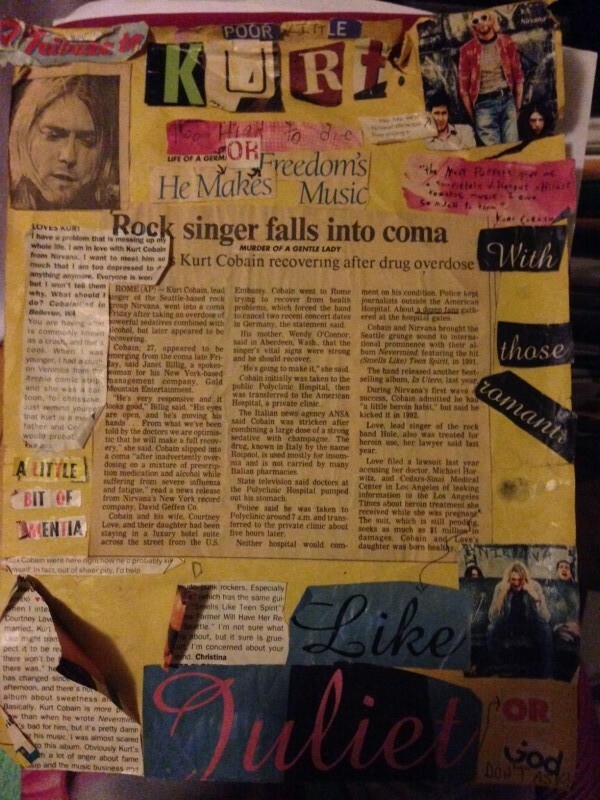 Even today while searching for my own fathers life insurance policy I came across this, a collage a junior high friend had made for me regarding his death. Kurt was the first person I ever felt I knew personally that took his own life. He was unfortunately not the last. He was the rip in the page that made death real, that made absence present, that made a void that couldn’t be replaced. Only to be followed by many others over time of course- I was only but a young child- there was so much more to this world than I ever realized at this point and time- but at that moment he was my idol— and he was gone forever. We all grow up, we move on, we lie to ourselves and pretend its okay, eventually we heal. But truth is that there is always a soft spot in my heart for Kurt Cobain. 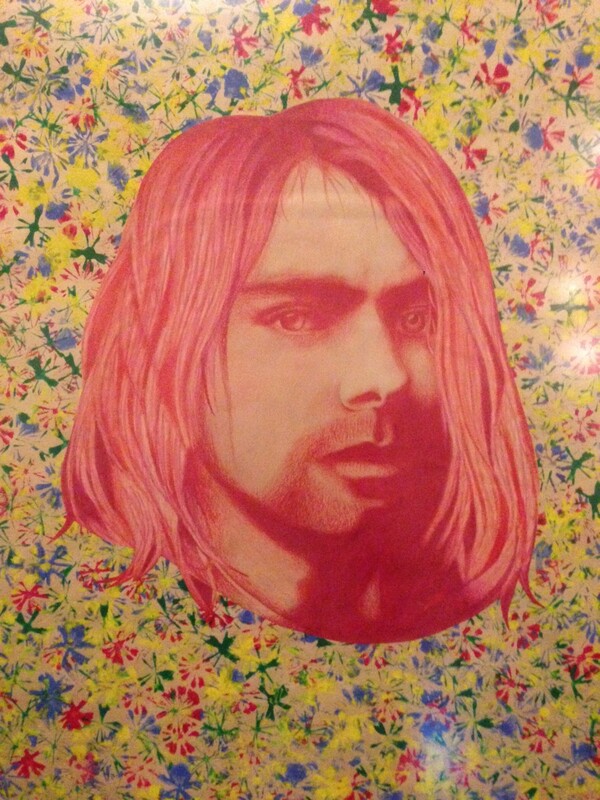 RIP Kurt. Thanks for everything.